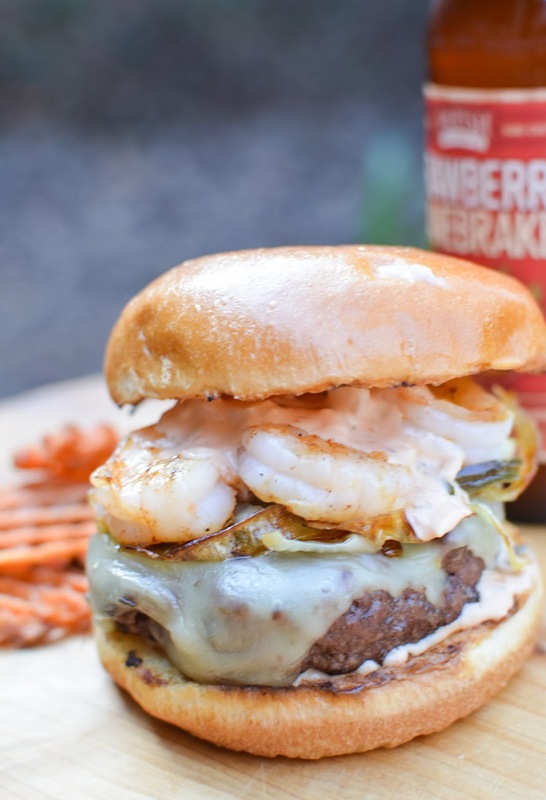 I bet you want this burger right now.Who wouldn’t want a Surf and Turf Burger with pepper jack cheese, sautéed onions and jalapeños, and a homemade burger remoulade sauce? I don’t know about you, but we probably couldn’t be friends if you didn’t like a burger like this one (or at least probably couldn’t go out to dinner together). I’m one of those “I like a lot on my burger” kind of girl. You know, loaded all the way. That’s why this burger speaks to me. 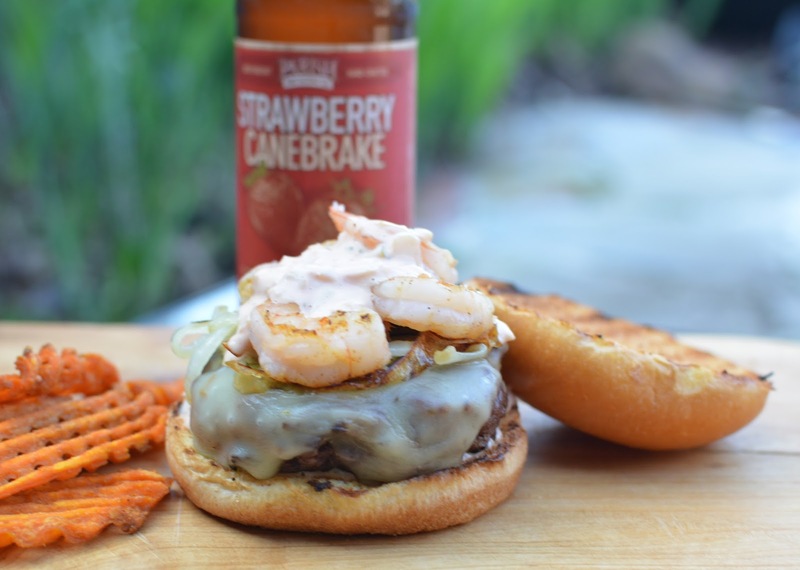 The idea for this burger started with the remoulade.I was thinking about grilling some shrimp for dinner and making a quick remoulade , but knew that wouldn’t cut it for the hubs. He said that he wanted to grill burgers, so I thought, let’s combine the two and so it began. Season hamburger meat with 1 tablespoon Creole seasoning. Divide the meat into 4 equal portions (about 6 ounces each). Form each portion loosely into a 3/4-inch-thick burger. Heat a gas grill to high or heat coals in a charcoal grill until they glow bright orange and ash over. Grill the burgers until golden brown and slightly charred on the first side, about 3-4 minutes. Flip over the burgers. Cook beef burgers until golden brown and slightly charred on the second side, 4 minutes for medium-rare or until cooked to the desired degree of doneness. Top with cheese and allow to melt. At this time, I usually toast the buns for a minute. Heat 1 tablespoon olive oil in small pan over medium-high heat. Add onions and jalapeño slices and cook for 1 minute until starting to brown. Lower heat and cook for another 5-6 minutes until onions are translucent and golden in color and jalapeño slices are browned. Peel and devein the shrimp, leaving the tails on. Drizzle ½ tablespoon olive oil over shrimp and season with remaining ½ tablespoon creole seasoning. Place shrimp on grill over a high flame for approximately 2-3 minutes on the first side, flip and cook for approximately 1 ½ -2 minutes on the other side. The shrimp should be pink or white, with no transparency. Combine all ingredients in a small bowl and mix well. Season with salt and pepper to taste. Keep refrigerated for up to 1 week (it will be gone before then). 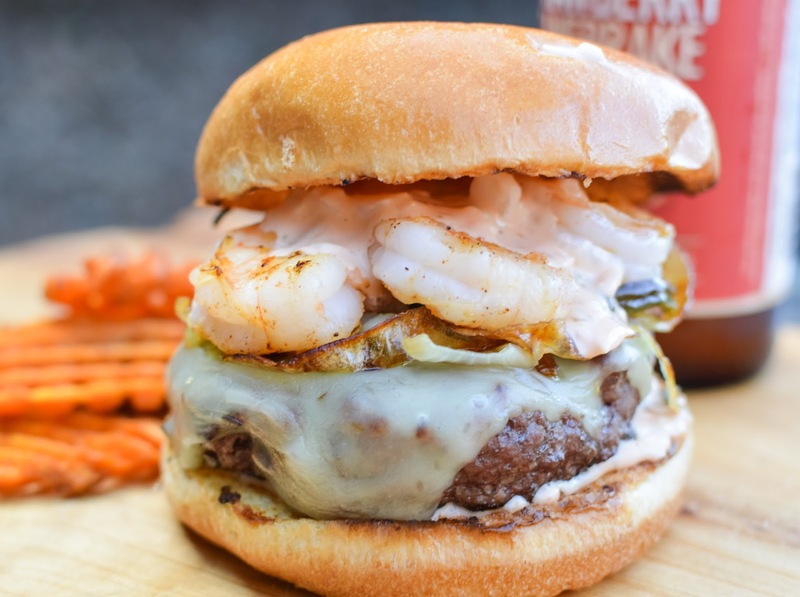 Sandwich the burgers between the buns, add the shrimp, sautéed onions and jalapeños, and top with the hamburger remoulade.